The success of this bread is made that much greater if a baking stone is used in the base of the oven. Alternately, an overturned heavy sheet pan will work. A pizza peel is also particularly helpful for placing the flatbread dough in the panggangan and removing the bread when it’s finished. A flat sheet pan or an overturned rimmed sheet pan will work as well. The dough can be made, of course, by hand, but I found the dough dramatically more beautiful, softer and stickier (which like pizza dough, is better for flatbread) made in the food processor fitted with the metal blade. This recipe is based on Barbara Abdeni Massaad’s Man’oushe. Makes 4 loaves. Garnishes: tomatoes, picked turnips, mint, arugula, labneh, etc. Proof the yeast in a small bowl. Mix the yeast and sugar together, then slowly add ¼ cup of the lukewarm water while stirring to combine. Set aside for about 10 minutes until the yeast is foamy. Set the dough to rise by placing the dough in a bowl that is completely but lightly oiled, and turn the dough so it is entirely coated with oil too. Cover the bowl with plastic wrap and then a kitchen towel and place in a warm spot (I put it in the turned-off panggangan that’s been just barely warmed) until doubled in size, 1½-2 hours. Deflate the dough by removing it from the bowl and pulling off four evenly sized balls of dough. Set the balls on a lightly floured surface and coat lightly with more flour. Cover with the plastic wrap and kitchen towel and rise for 20 minutes. Meanwhile, preheat the oven. Place the baking stone or overturned sheet pan (it’s overturned so the edges won’t get in the way of placing and removing the dough) in the bottom of the oven. Remove the racks or line them at the top of the oven. Heat the panggangan to 400 degrees for 20-30 minutes. Convection baking is ideal here, if possible. If you’re using convection, set the panggangan temperature to 425 degrees. In a small bowl, combine the za’atar and the oil, stirring well. Set aside. Roll out the dough: lightly flour the work surface, the rolling pin, and the peel (or another overturned sheet pan to be used as a peel like a huge spatula). The flour acts as ball bearings for the dough to keep it from sticking to surfaces. Place one ball of dough on the floured surface and press down on it with the palm of your hand. The key to getting the dough rolled flat and round is to keep it moving, which means turning it frequently throughout the rolling process and adding more flour lightly to the work surface as you go. Roll the dough from the center of the circle to the edge a couple of times, then rotate it, and roll again, repeating until the dough is round and ¼ -inch thick. Spread 3 teaspoons of the za’atar mixture on the dough using the back of the spoon or your fingertips to get an even, thick spread. Leave a ½ -inch rim around the edge. Slide the peel under the dough, using two hands (to avoid misshaping the round) to pull the dough onto the floured peel. Place on the baking stone in the panggangan and bake for 7-10 minutes. You’ll want to keep the panggangan light on to watch the bubbling baking show. When the bread is golden brown at the edges, remove from the panggangan to a baking rack and cool for a few minutes. 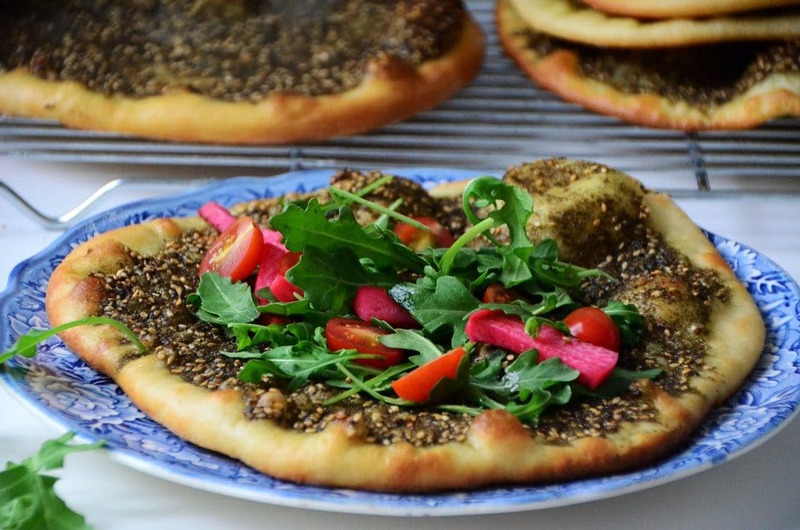 The za’atar topping may seem oily when it’s still hot but it will dry and taste just right. Repeat the process with each of the four balls of dough. Eat the man’oushe as it is, torn off and eaten with the garnishes. Or top the bread with garnishes, fold over, and eat it like that.